We assume you have a very basic understanding of PHP and editing PHP files. If you do not, it is probably a good idea to get some support from a CiviCRM expert. You can find one on Find an Expert. You can use CiviProxy to do a couple of things related to mails and mailing for you. You can still see all the stuff on the CiviMailing report like the click-throughs and bounces and such. You do not want the links in your bulk mailing or individual mails to immediately feed back to your CiviCRM installation but pass through CiviProxy. You want your subscribe/unsubscribe links to pass through CiviProxy rather than go directly to your CiviCRM installation. If you want to do any of these things, you will need to install and configure the CiviCRM extension de.systopia.civiproxy in your CiviCRM installation. If you have not installed the extension already, check Installing CiviCRM for instructions how to. If you do not install the de.systopia.civiproxy extension you can still use CiviProxy to whitelist your API requests. Once you have installed the CiviCRM extension you will need to configure the CiviProxy settings. To do this, go to Administer>Administration Console. You will see the CiviProxy Settings in the System Settings section of the menu as you can see below. A checkbox CiviProxy Enabled to enable or disable the CiviProxy functionality with your CiviCRM mailing links. A text field Proxy URL where you can add the URL of your CiviProxy server. This link will be validated and the version of the CiviProxy will be shown. If the URL does not meet the validation (does not contain a valid CiviProxy installation), there will be an error message. A text field Custom Subscribe/Unsubscribe Pages for a path to the unsubscribe page that will be used. There is a basic unsubscribe page on your CiviProxy server, the path to this page will be the default. If the default unsubscribe page is not what you would like, then you can either update the page in the CiviProxy installation on your server or create your own page and set the URL here. If you do create your own subscription page make sure the parameters and returns and such are the same as in the default unsubscribe page! In the screen print below you can see the CiviProxy Settings page with the values I have used for my test installation when producing this guide. The CiviProxy server is the actual policeman that receives all requests and decides if they are allowed to send data to or retrieve data from CiviCRM. It consists of a series of scripts which you need to install on the server as explained in Installing CiviProxy. Once you have installed your CiviProxy server you need to complete a few configuration steps. 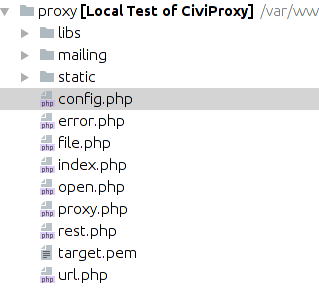 The configuration of CiviProxy is mainly controlled with one PHP file called config.php. Create this file by copying or renaming the config.dist.php file. This guide assumes a Drupal7 target CiviCRM with clean URLs enabled. If this is not the case for you, you might have to adjust the URLs and/or encounter issues. If so, please report on GitHub! Next thing you want to configure is what your target CiviCRM is. This is the CiviCRM installation which you want CiviProxy to police, so the one where the actual data resides and is collected from or sent to. If you set it to the value NULL this functionality will not be available on your CiviProxy server. You can update these settings if you should want to. When you want to use the CiviCRM API from another server than the one CiviCRM itself resides on you will do so using the REST interface. To be able to access your target CiviCRM with the API using REST you will need to configure an API key and a site key. Actually, you will most likely need more to be able if more outside applications are allowed to access your target CiviCRM. In CiviProxy you can either store the API and Site keys directly in the config.php file or you can include a secrets.php file in your installation which holds your key values. As you can see you can give the application that is accessing you different keys than the ones you use to access your target CiviCRM. So in this example I will explain to the party wanting to access my CiviProxy that they have to use the key 1234#tsT#eR1k and the api key eR1k!tSt4321. My target CiviCRM will expect site key p1P0!tEst1Ng5678 and the api key cal1Mer0#tST. Even if you have entered your API and Site key, and the setting for the target REST is ok, you will not be able to use any API calls through CiviProxy just yet. As CiviProxy uses the whitelisting principle by default no API calls are allowed unless they have been whilelisted. Also parameter sanitation is used. This means that only the specified parameters are allowed, and only content data of the specified type will be allowed. You can whitelist an API entity and action (and a set of allowed parameters) for all request from outside, but you can also whitelist an API entity and action ONLY if it comes from a specific IP address. the API Contact getsingle with parameters first_name and last_name is only allowed if it is requested from IP address 123.45.678.1. That format will still work, but is considered deprecated and you are encouraged to adapt to the new format described in the section above. because first_name and last_name are not whitelisted, they get ignored and a Contact Get without parameters if passed to the target CiviCRM, returning the first 25 contacts are a result...which is not what we wanted. We recommend solving these situations by developing specific API's rather than using the core ones. And if you think of a good solution feel free to raise an issue or do a PR! CiviProxy has a $debug setting which allows you to add the name of a text file where all requests are send to. This can be used during the initial testing to see if everything is processed correcty. If you set the $debug setting to NULL this feature will not be used. We recommend only using this debug feature in the testing face, never on an active production installation as it can produce a massive log file quite easily. There is a setting for a local network interface or IP to be used for relayed queries. If you have no idea what this is about, just leave it as is. We do advice you to monitor what request are still being fired directly to your target CiviCRM once you installed and configured CiviProxy, and then find solutions for the situations if you still see some undesired access requests.